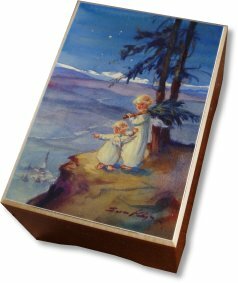 Home > Childrens Music Box > Swiss Musical Boxes - "Little Angels"
This petite wooden music box is made in Switzerland and has a printed picture on the lid. The clockwork 18 note musical movement is wound from underneath and when the lid is lifted plays "Canon". The movement is fitted on show under a clear cover. To one side is a small storage area suitable for rings, chains or trinkets etc. Approx Size : 107 x 75 x 60mm (4 1/4" x 3" x 2 3/8"). 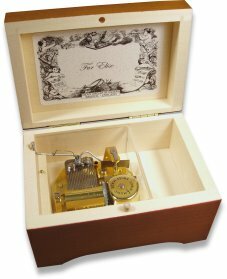 IMPORTANT NOTICE - Please be aware that although these music boxes and the components inside are sealed, they do contain small parts and a removable metal key. Therefore, they should never be considered suitable for very small children or babies. If you are unsure about suitability, please telephone and ask one of our staff for guidance. Please note - although we take as much care as possible to show pictures of the actual product, because this is hand made from wood, the colours may naturally vary slightly from those shown.